I noticed when I met “Twiggy” the dachshund mix he had little trust in humans but he opened up around other dogs. This could be because his past experiences with humans weren’t all so great but his experiences with dogs were always positive. I took him in and trained him for a couple weeks. I watched carefully as he’d make his rounds with the rest of the dogs I was training. I already had an established pack at my house. Some were just like Twiggy, shy, unsure, no confidence. Others were very bold, outgoing and fearless. Twiggy happened to make friends with a male Min Pin named Tyson who happened to be one of the bolder personalities in the pack. He’d follow him around everywhere he’d go. Tyson would walk across the yard and Twiggy would follow. Tyson would begin playing with a toy and Twiggy would do the same. This led to my next step in the process. Now I know Twiggy is friends with Tyson I’m going to make Tyson the trainer. How do I do it? I do it through a technique called “Daisy Chaining.” Daisy Chaining in tech talk terms is a wiring scheme in which multiple devices are wired together in sequence or in a ring. Example: Computer A controls computer B. Computer B controls computer C. And so on and so forth. Well the same rule is applied here. Tyson is already being trained by me which makes me his leader. Twiggy doesn’t exactly trust me yet so I can’t say I’m a solid leader yet. However Twiggy looks up to Tyson so effectively Tyson is Twiggy’s leader for the meantime. Are you following?… Now, the way I solidify this Daisy Chain process is through a simple tether system from human to dog to dog. My leash attaches to Tyson’s collar while a separate leash gets attached a harness he’s wearing. The end of that leash is attached to the harness Twiggy is wearing, effectively completing the Daisy Chain. Now the chain of command has been set by this system. I’m leading Tyson while Tyson is leading Twiggy. Now it was time to train. The point of this training was not to train Tyson. He was already confident, bold and needed little in that department. This was for Twiggy. He needed a workshop in confidence so off we went. We walked around town, to each and every corner loud and quiet. This was not your usual stroll. It was a crash course in the unpredictable world we live in and Twiggy was the student. About 10 minutes into our walk we approach a small crowd of people and I feel the Daisy Chain get a little heavy. That’s because Twiggy put the brakes on due to the unknown crowd. I didn’t command Twiggy to keep moving at all. I commanded Tyson to do so. 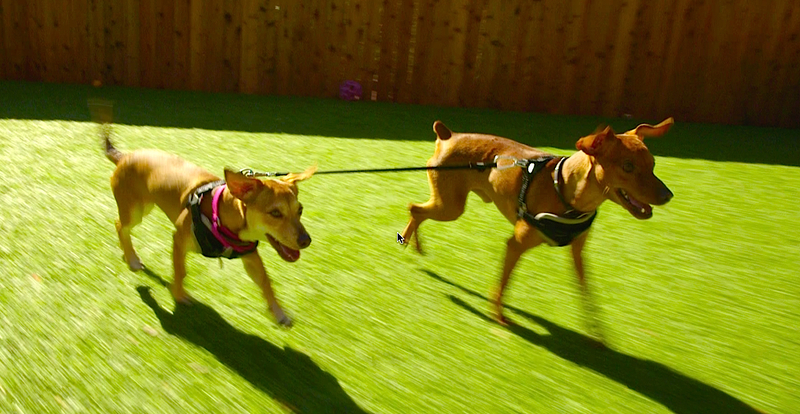 In turn Twiggy began moving as he was following Tyson’s lead. A few minutes later we came upon another crowd of people, but this time it was a little larger and had much louder personalities. A couple of them were laughing and talking very loud. As we walked towards them I once again felt Twiggy put the brakes on, anchoring the Daisy Chain down. So once again I led Tyson, commanding him to keep walking with his head held high which in turn gave Twiggy the confidence to do so as well. We walked, then we walked, then we walked some more. Confronting situation after situation. Myself observing as Twiggy was slowly being trained under the leadership of his new buddy Tyson. Over the next couple weeks we walked in the Daisy Chain everyday. By the end I was walking Twiggy alone, no Tyson, no timidity…just a confident little dog who’d faced his fears and gotten over his issues with people. So let’s break it down; why did this technique work? It’s well known that dogs are social, pack animals and look for leadership. Every dog in the pack has a position much like an employee at a company. Some are leaders, others are followers. You’ll have your president, vice president and those who work under them. Every employee takes orders from someone much like every dog in the pack follows and learns by another dog. Twiggy was definitely a follower and Tyson’s personality made him a leader. This combination was perfect for the training technique but simply placing them together wasn’t good enough. Just because two dogs are around each other doesn’t mean one is gonna follow the other. That’s where daisy chain technique came in. This tethering created a synthetic type of “follow the leader” if you will. I knew that Tyson’s personality would simply pull Twiggy as they walk. Twiggy’s personality was to resist at first but trusting Tyson’s decisions to walk up to people and engage gave Twiggy the courage as well. The daisy chain is just like me pulling a dog on a leash but if that dog doesn’t trust me they’ll surely put the brakes on and resist, effectively making their timidity and fear of socialization even worse. So instead of the dog getting corrected by a human, they’re getting corrected and trained by another dog. A dog like Twiggy trusts other dogs while he still has reservations with humans. Dogs are often the best dogs trainers. After all, a mother dog teaches it’s puppy more than a human ever could. A dog’s need for leadership is engrained into their DNA and I simply capitalized on it. A few things to point out here. First off be sure the “Daisy Chain” tether is connected from harness to harness not collar to collar. Much safer for both dogs this way. Also it’s much more recommended the leader dog is either equal size or slightly larger than the follower. In other words a Chihuahua daisy chained to a Rottweiler is never recommended. Too dangerous for the Chihuahua. Also this is only to be done for socialization of dogs with humans. It’s never recommended to be done with other dogs at a park for socializing purposes. Too dangerous for that environment. Always remember dogs don’t learn at the speed of light, they learn at the speed of life. Patience and persistence wins the fight. Dogs are always looking for leadership so keep in mind your actions lead to their reaction. And always keep in mind my 3 rules of training: Control, Train, Treat. First we get our control, then we train and finally we treat. We never go out of order of these rules as they’re the blueprint of my training. If you have a shy dog try this technique out yourself. It’s very simple and fun. Remember progress is what you’re looking for. I rescued a 15month old shih tzu 9 months ago. He’ll be 2 soon. He hates people and other dogs. Loves his family. (except for bath time or any type of grooming and sometimes to pick him up for whatever reason) At home he’s a pretty good boy. He’s a nightmare with vet visits and has to be put out for all haircuts. He knows how to sit, give paw, lay down and a bit of a stay. My vet only sees him as being a crazed dog who he says clicker training wouldn’t even help. He’s even put him on prozac since he seemed to have a nervous breakdown after having him for just 2 months. He said he seemed to have ptsd. I shook a bottle of pennies when he jumped on my bed and he barked like crazy then totally zoned out. He wouldn’t even sleep. His head would bob and he would catch himself to stay awake. He was also jumping on things like coffee tables and chairs and falling off things. It lasted about 24 hours and he started to get better. All better now. Well my vet Suggested a boarding e collar training, or behaviorist or fiesty fido class. I’m at my wits end. I don’t know what method to choose. I can’t afford trying everything, but I need to start somewhere. Another strange thing is he can take or leave his food no matter what brand i give him. He has to be coaxed to eat. Once he starts to eat its like he’s starving. It’s like he’s afraid of his food. I know adopting a rescue is the right thing to do but now I need help. My little guy can also say no to treats and toys when asked commands at times too. This can make training extra difficult. He’s so stubborn. Any suggestions? Did you get any help? My rescue has some of the same responses. I’m working with him, but he seems frightened often still. Thanks Brandon. Watch your show faithfully! Love the tips. I am on Board for no kill shelter. PAWS FOR LIFE in Pueblo, Co. Would love to somehow get your help W a clinic or something…. I know you are busy but??? Great Article Brandon. Thank you for sharing it with us. Brandon – great article, thanks!! What can one do with a dog needing socialization that has issues with other dogs, too? My rescue had zero socialization as a pup. She wants to interact (people or dogs) but the fear takes over which then leads to aggression. My goal is keeping this death row rescue from landing back on death row. If returned to the rescue, she’d be put down – plus, she’s a great dog (once she trusts someone), that I want in my life for the rest of her life. She learns to trust one person at a time but hasn’t generalized trust to all people. She is very, very obedient, but her social skills are lousy. Any help? Many thanks!! I have the same problem with our rescue dog. She’s wonderful at home with just us but when introduced to other people she just goes crazy for about 15 minutes of barking, growling, snapping and snarling. Have you come up with a solution? Love the idea of the Daisy Chain. One question: Will this work if the lead dog is on a leash and walking in front of me? Do you have any recommendations for working with a dog alone. We do not have a ‘buddy’ for the dog to work with. Your tips are real tips because you leave nothing out, you cover everything, and you do it humbly! Bless you my friend! You are helping me create a new chapter in my life working with rescues! Peace! Hi all, reading some comments, I could offer my experience with what helped our boy. We too were told to give up, that he needs to be treated like the bottom of the pack, so basically little love. Also to try the e-collar. This was from a so called behaviourist. Please don’t give up, or take that advice! Not all dogs respond to that, especially those who have issues and are rescues who have been bounced around from home to home. They honestly need love, to be treated like a toddler. BUT – the best thing we did was work on his reactions to things, dogs, humans. Instead of seeing someone of thinking “oh no, someone new, I’m scared, I must protect myself” he would associate such a situation with something positive. So we started to break this down by making the new situation = cheese (his most favourite food, he’s not really food orientated). So we would see someone new, and we would give him cheese with lots of “good boy”. Then we would get the new person to throw him some cheese while not acknowledging him. This was a very slow process. Eventually he would take the cheese from their hand, while the person is calm and not acknowledging him. Then he would have to sit, wait, shake etc for the cheese once he was OK. He is now great with new people, because new people = cheese!! He knows its not something to be scared of, we’ve broken down his reaction and helped him. A lot of issues need to be retraining of their reactions to things, like the daisy chain does. It takes time, love, and most of all trust. It took us about 8months and it has been so worth it. Good luck to all, rescue dogs are certainly special, but they deserve the patience and chance. I watched you train Groot this morning. We adopted a Jack Russell mix from Raintree Jacks Rescue in SC one week ago. She is 18 mos old, and full of life. She socializes with the other 2 dogs with no trouble. She seems to have taken to us as well. But…. she does the same thing Groot was doing in the beginning. When you reach down to put her, or give her a treat or anything, she ‘hunkers’ down flat against the ground, all stretched out. If you pick her up, she will lick and lick you, but still seems afraid when you reach toward her. I bought a clicker, but could sure use some advice on how and when to get started. I was afraid to start before she was acclimated to her new home, because I know she been several places in a relatively short time. My comment on May 20, 2015 is still awaiting moderation. What does that mean? Thanks Brandon! My sheltie pom mix is affraid of everything . Wind leaves orher dogs people EVERYTHING.what can i do to stop this ? She is stressed all the time i feel bad for her . I have a sheperd/boxer mix. We got him when he was 3 months old. he is now 1 1/2 yrs, 81 lbs,He didnt exsibite these issues till he turned 1. we have had 2 fights with our pitty. who is 7yrs old, but both times it was an attention issue, the first was bad .Max the mix, took stitches and drain tubes, He very insecure and anxity issues, does listen, drags me all over, the second fight was when I had a trainer here .who is suppose to help me get control of the walking issue and anxity. I guess my concern will he an my pitty gonna beable to live together, right now we are keeping them seperated. Where can I buy a Daisy chain? I have adopted a 4 yr old Toy Poodle, Brie, and the resident dog , Truffles, is same age and breed. They bonded quickly. The problem is Brie was a breeding dog. She was never trained in the basic commands and is very timid. She was not potty trained and is not familiar with walking on a leash. . I want to utilize Truffles in the same way Brandon did on this episode to help Brie with overcoming many of her fears. I have a chihuahua mix who is basically perfect. (Paltrow). She doesn’t bark, loves people and usually other dogs also. Everyone in the neighborhood knows her as the sweet little chihuahua and kids love to learn to pet dogs with her. She is 12. I just rescued a 1 1/2 year old chihuahua mix (Pico) to keep her company while I work. He is a little ball of love. He immediately adopted me as “his.” The first week was fine but now when we walk, any dog or person he sees, he starts going crazy chihuahua with barking and trying to run at them and basically going crazy. One person I know let their dog go ahead and come up and he petted Pico and he calmed down a lot. but next person we saw, he did the same thing. I can’t really take him walking. People move to the other side of the street or glare at me and I don’t know a lot of people to have them come and help with new person introductions. I wanted to do this daisy chain training with Paltrow since she is so good, but it doesn’t seem like it will work since instead of being shy, Pico lunges and barks at the people/dogs. What would you recommend for training this type of aggression or fear of people. I know he’s protecting me since it didn’t start till the second week after he adopted me. He HAS to be on me or close all the time. Thank you for your time and for what you do. It is so nice to have an example of positive dog training. If you can help and have time to write me what to do, I greatly appreciate it, thank you! Hi Penny! I have inherited my daughter’s Chihuahua, Dachshund, Terrier mix. She is fine with me but is timid or aggressive with others. If she gets spooked while someone walks by she will rush them and try to bite. I thought our situations sounded similar so I was wondering if you’ve found any help yet. I have a 5 yr old Pekingese. He is very bonded to me. I got him when he was 7 months old and neu.tered him shortly thereafter . The previous owner kept him in a laundry room all day . His only companions were a teenage girl and a cat. When I got him I worked hard to train him. For the most part he obeys me…. but …. he has bitten my 80 yr old mother on several occasions (for touching him). He also lunges at dogs, barks at dogs who walk past the yard… and he hates visitors and strangers if they look directly at him or talk to him. If they ignore him then he presses his paws on their feet for attention . I don’t know how to correct him when he goes into his aggressive puppy Jekyl self. It seems fear based but I’m not sure. Maybe he just has a really high opinion of himself , thinks he’s a boss …and refuses to let other dogs or other people get near him… like he thinks he’s royalty or something. I cannot afford a professional behaviorist, vet bills are expensive enough. I’d love to help my Ziggy and wish I knew what to do . I’ve thought about letting him just watch other dogs at a dog park from a distance and then heavily rewarding him for being calm ….then slowly getting closer week by week? He is also afraid of and will attack stuffed toys as well as aggressively lunging at the kindly old Rottweiler in the next yard (through a fence). I have put a mirror in front of Ziggy to see his reaction…. and he seems to like his own reflection, play bowing ….and even kissing the mirror!!! So he likes me, he likes cats and he loves his own reflection.. He also seems to like / plays with / tolerates my brother. He only seems to like my mother when we are on a car trip together…. or if she feeds him, but he will never let her touch him. Hello Brandon, I adopted a rescue coming from a closed shelter in Puerto Rico a year ago. She is a four-year old Australian Kelpie mix. She is over protective, on a leash she cannot be pet and gets very aggressive toward humans or other animals. Would you be able to train her? Thank you so much!